American business tycoon Warren Edward Buffett is the current CEO and Chairman of multinational conglomerate Berkshire Hathaway. He holds assets and wealth amounting to $80.6 billion, which makes him the fourth wealthiest man in the world. In 2008, he was assumed to be the richest person in the world, before he donated half his wealth to charity. He is thus considered a good philanthropist. As he started his career as an investor, he is one among the best investors. Microsoft's head and businessman Bill Gates is Warren Buffett's close friend. Buffett has donated large sums of money into Bill gates charity -'Bill & Melinda Gates Foundation'. Warren Buffett was born on August 30, 1930 in Omaha, Nebraska (U.S). His father Howard Buffett was a politician and was elected to United States Congress for four terms. Warren took a liking for business and used to come up with new entrepreneurial ideas every now and then. He started with selling chewing gums and Coca-cola bottles. He used to deliver newspapers and magazines, door-to-door and by the age of 15, he started making 175 dollars a month by delivering newspapers. He bought a pinball machine for $25 and placed it in a barber shop. With the profits from the machine, he was able to buy three more machines. Warren later sold the business for $1200. Buffett filed his first tax return in 1944. Warren Buffett began investing from an early age and bought three shares of Cities Service, when he was only 11. When he was 14, he bought a 40-acre farmland with his savings. With the profits, he saved $9800. He graduated with a Bachelor of Science in Business Administration from University of Nebraskaâ€“Lincoln. He later earned a Master of Science in Economics from Columbia Business School. Warren Buffett worked as an investment salesman at Buffett-Falk & Co., where his father used to work before him. He stayed on the job from 1951 to 1954. Warren used to follow investor and businessman Benjamin Graham, who was also Warren's professor at college. Buffett worked at Graham's firm Graham-Newman Corp, as a securities analyst for 2 years. He was on an annual salary of $12,000 a year. Then in 1956, he started his own company named Buffett Partnership, with partner Charlie Munger. When Warren Buffett was in his hometown Omaha, he resumed his work as a stockbroker and started taking night classes, teaching investment principles, in University of Nebraska.When Benjamin Graham dissolved his firm, Warren Buffett had a saving close to $174,000. By the 1960s Warren Buffett was running many partnerships and had become a millionaire. He merged all the partnerships into one. Warren acquired textile manufacturing firm Berkshire Hathaway from owner Seabury Stanton and bought shares from him. Warren appointed Ken Chace as the new President of the firm. However, the textile business did not fruit any profits and Buffett had to shut it down eventually. In 1979, Berkshire's shares were at the price of $775 per share and reached $1,310. 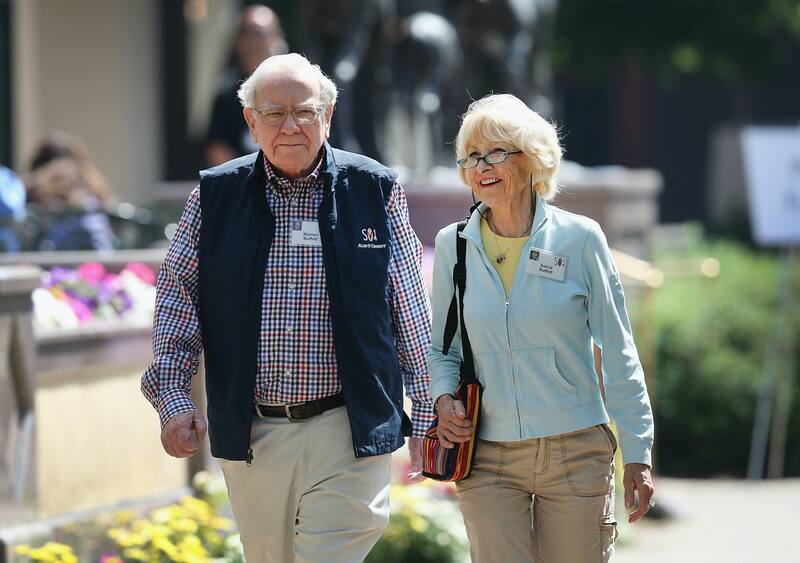 Buffett's net worth took a boost and amounted to $620 million. From 1973 to 1979, Warren Buffett acquired Wesco Financial and acquired 25% stakes by brokering the acquisition deal of media company ABC by Capital Cities. During the early 1990s, Warren bought 12% stake in Salomon Inc and became its working chairman while the company was under crisis. In 1988, Buffett slowly purchased up to 7% stakes in The Coca-Cola Company. In 2008, Forbes magazine announced that, with net worth of $62 billion, Warren Buffett became the wealthiest person in the world surpassing Bill Gates. Though Buffett lost $25 billion during the financial crisis of 2008-09. Warren also donated a big share of his wealth to Bill and Melinda Gates Foundation. Earlier in 2006, Warren promised an equivalent of 10 million Berkshire Hathaway Class B shares, amounting to $30 billion, to Bill & Melinda Gates Foundation. The conditions of the donation were such that 5% shares will be given every year starting from 2006. In December 2009, Warren Buffett along with Bill Gates and Mark Zuckerberg started "Gates-Buffett Giving Pledge", where the wealthy people were to give away at least half of their wealth to charity. Warren Buffet married civil rights activist Susan Thompson in 1952. Susan bore Warren three children: a daughter Susie and two sons Howard and Peter. Warren married his friend Astrid Menks in 2006, after Susan passed away in 2004. Warren Buffet is a close friend of Microsoft's owner Bill Gates. The two spend a lot of time together and talk to each other over phone every day. Buffet is fond of Bridge game and plays it with Bill as well. âž¯ Warren Buffet never shied away from doing small jobs. He believes that the nature of the job does not matter and what matters is the consistency of doing a work. âž¯ Warren Buffett is an American businessman, investor and philanthropist. âž¯ Warren Buffett was born on August 30, 1930 in Omaha, Nebraska. âž¯ Warren Buffett's father Howard Buffett was a Congressman. âž¯ Warren Buffett has been an entrepreneur since an early age. âž¯ Warren Buffett used to invest in stocks and his first shares were of Cities Service. âž¯ Warren Buffett sold Coca-Cola, chewing gums, newspapers and magazines while he was still a teenager. âž¯ Warren Buffett started his own company named Buffett Partnership, with partner Charlie Munger, in 1996.
âž¯ Warren Buffett acquired textile manufacturing firm Berkshire Hathaway from owner Seabury Stanton. âž¯ "Someone's sitting in the shade today because someone planted a tree a long time ago". âž¯ "People will always try to stop you doing the right thing if it is unconventional". âž¯ "Risk comes from not knowing what youâ€™re doing". âž¯ "All day you wait for the pitch you like; then when the fielders are asleep, you step up and hit it". âž¯ "It takes 20 years to build a reputation and five minutes to ruin it. If you think about that, you'll do things differently". âž¯ "Draw a circle around the businesses you understand and then eliminate those that fail to qualify on the basis of value, good management and limited exposure to hard times". âž¯ "Love is the greatest advantage a parent can give". âž¯ "I wouldn't mind going to jail if I had three cellmates who played bridge".